My husband and I recently had our microbiomes sequenced. The results and implications are fascinating. While working out way through the research on the human microbiome, as well as ancestral and hunter-gatherer diets, it became clear that dietary fiber, and resistant starch in particular plays a critical role in the health of the microflora in our guts. Modern day hunter-gatherers consume as much as 150 grams of fiber a day, mostly as resistant starch while omnivores hover around 19 grams, paleo dieters around 23 grams and vegans who eat about 43 grams of fiber daily (read more here). On a typical day, as an omnivore who follows the principles of traditional foods pretty closely, I consume about 30 grams daily. Post-microbiome sequencing, my husband and I decided to go on a Standard Process cleanse, which dramatically increased our fiber intake owing to supplements and shakes. During the cleanse, we began eating between 40 and 50 grams of fiber each day. This was the single-most valuable aspect of that cleanse for us, and when we finished up our twenty-one days, we committed to eating more fiber and more resistant starch. Adding a handful of tigernuts each day, has made that easy, as a one ounce of tigernuts packs a whopping ten grams of dietary fiber. Despite their name, tigernuts aren’t nuts at all; rather, they’re a member of the nutsedge family. They’re small, wrinkled little tubers, full of resistant starch. They’re not nuts, though they offer a pleasant nutty flavor and texture. They grow just beneath the soil’s surface, like potatoes, and they featured prominently in the diets of paleolithic peoples throughout West and North Africa. They’re used to produce a naturally gluten-free flour high in resistant starch, as well as tigernut oil with a gorgeous golden color and a sweet, mild nutty flavor similar to chestnuts. Tigernuts are also particularly rich in resistant starch. Resistant starch is a prebiotic (learn about prebiotics and probiotics here), that is, it helps to support gut health by providing food for the be beneficial bacteria in your gut. The type of starch found in tigernuts is indigestible to us, but it feeds the microbes in our guts, helping them to proliferate and to increase in diversity, and offers a host of benefits (read more here). Moreover, research shows that resistant starch can help to support optimal body weight, enhance insulin sensitivity, and help to regulate blood sugar (read it here). It provides powerful nutrition for the bacteria that fuel your gut, and your gut bacteria are critical to fueling your health. They work synergistically together. One feeds the other. You can also find resistant starch in potatoes and sunchokes, but tigernuts remain the best source. Keep in mind that the benefits of resistant starch changes when heat is applied, but they return as soon as food cools down, so if you wish to enjoy the benefits of foods rich in resistant starch, eat them raw or cooked and cooled to room temperature. Me? I like to snack on them raw, straight out of the bag. Last year, I took two rounds of antibiotics for two serious infections. While the antibiotics knocked out my infections, that double whammy left me with worsening asthma and allergy symptoms as well as an extra thirty-five pounds on my frame without any significant changes to my exercise or diet. Yikes. That leaves me to focus on rebuilding my gut health, as well as working with a physician. Weight, like many aspects of health, is intricately related to the microbiome (read it here and here), and it’s my hope that by supporting my gut health, post-antibiotics, I might optimize my systemic health, too. Monounsaturated fat, the same fat found in heart-healthy foods like avocado and olive oil, is the dominant fat in tigernuts. Monunsaturated fat helps to support heart health, good (HDL) cholesterol and insulin sensitivity. When tigernuts are pressed, they release their oil, and that resulting oil is not only a good source of monounsaturated fat, but it is also source of vitamin E. Vitamin E is a fat-soluble vitamin and antioxidant that supports immunity, eye, skin and cardiovascular health (read more here). Tigernut oil was first pressed and used in ancient Egypt, where tigernuts also played a role in their traditional, ancient culinary heritage. With a higher smoke point than olive oil, tigernut oil is suitable for moderate heat uses like baking, and light sauteing, as well as used fresh and raw. Nutsedge is relatively easy to grow, if you want to try to harvest some yourself. I work with Organic Gemini, and made a beautiful tigernut milk with their nuts last year. You can find their tigernuts, oil and flour online here as well as in a handful of natural foods stores like Whole Foods peppered throughout the country. Tigernuts are small, wrinkled tubers with a faintly sweet nutty flavor. Full of resistant starch, they support gut health, optimal insulin response, optimal blood sugar and help to keep you full. Tigernuts are best served raw, as in this recipe, or cooked and cooled to get the most benefits of their resistant starch. This recipe comes together in a cinch, is mildly sweet with a punch of subtle heat. 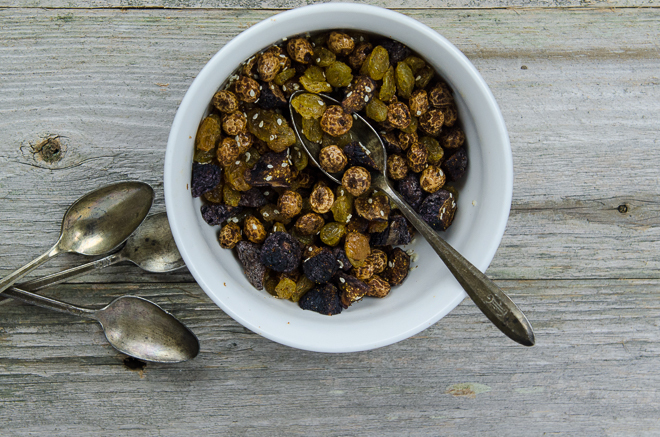 Toss the tigernuts, raisins and cranberries into a bowl. Drizzle with tigernut oil, and then sprinkle with paprika, cayenne pepper, sea salt and sesame seeds. Toss to coat. Serve immediately or store in an airtight container at room temperature for up to two weeks. Toss the tigernuts, raisins and cranberries into a bowl. Drizzle with tigernut oil, and then sprinkle with paprika, cayenne pepper, sea salt and sesame seeds. Serve immediately or store in an airtight container at room temperature for up to two weeks. I always love your blog and the introduction to new foods and ideas. Since I am allergic to wheat, I have started using banana flour which is also high in resistant starch. I didn’t know if you were familiar with it or not. Could one estimate their daily fiber intake by simply adding up the fiber content listed either on the Nutrition Facts (for packaged foods) or in the USDA nutrient database for the foods and amounts eaten during the day? I just discovered Organic Gemini Tigernuts a few weeks ago. They make a great snack and really satisfy when I get a craving for something chewy. Thanks for the great info Jenny and here’s to good health as you rebuild your gut. I know what you were going through – I was in the hospital for 7 days in 2005 with round the clock broad spectrum antibiotics, and I don’t think my body will ever fully recover. Thank you so much for your articles. I have had indigestion for the past two weeks after being on strong antibiotics for a sinus infection and also meds for candida. The sinus infection and the çandida are gone but the antibiotics definitely did my digestion in. I will try this tigernut recipe. It sounds delicious and also looking into making my own tormented foods. I also have your cookbook which I am be going to use also as it has so much information in it and recipes. I’m sorry to hear that you were sick, but it saddens me more that you had to resort to main stream antibiotics. You may want to research Colloidal Silver. You may want to check out The Silver Edge, I personally have this generator and am very happy with it, And it is pennies on the dollar compared to mainstream drugs. Both for your pocket and your future health. Colloidal Silver is a broad spectrum antibiotic and viruses or germs or fungi do not become resistant to it. You are more than likely dealing with yeast now in your bloodstream and will need to detox from that before trying to fix your gut. I would suggest a water fast to help in both of these areas. Can I say, been there done that on this subject. I use Colloidal Silver daily, both internally and topically. I has been over three years since I have been sick with any type of infection or virus. With respect, you have no idea what my infections were, what caused them, nor are you able to determine if I am “dealing with widespread yeast” or “yeast” in my bloodstream. You are not my health care practicioner, nor can you make any reasonable assertion based on the information I’ve provided above. If colloidal silver is, indeed, as efficacious as a broad-spectrum antibiotic, it would not be able to discriminate between beneficial, netural and potentially pathogenic bacteria, and would, therefore, have the same effects on the gut as a broad-spectrum antibiotic. For a time, in college, I tried colloidal silver and found it to be grossly ineffective. Personally, felt very uncomfortable with tone of reply. Tho “respect” introduced, I was still taken aback. “…If colloidal silver .…” down was most informative and necessary. I agree. Yikes! Just someone offering what they thought might help! You may want to exercise caution with sciencebasedmedicine.org . It is considered by many to be the next “quackwatch.com” (i.e., -sponsored beind the scenes by ‘mainstream’ medicine/dentistry/etc, astroturf-style). Just take what they say with a grain of salt, and confirm any compelling information for yourself. That website “disproves” all holistic/complementary healing methods, from the benefits of saturated fat, vitamin K2, the GAPS diet, the dangers of flouride and just about everything else most readers of this blog are interested in. The fact that sciencebasedmedicine doesn’t believe in the benefits of colloidal silver is pretty insignificant when you consider their overall bias when it comes to all non-pharmaceutical remedies. While I’m personally not the biggest fan of colliodal silver, I would refer readers to the FAQ section on the WAPF website, or some other source that is considered by this readership to be more reliable and trustworthy. This looks delicious! Can you say more (now or in a future blog) about the microbiome testing you had done? Who performed the test? Did you get specific pointers on how to improve, or did they just give you the info and then you do your own research? Thank you for another wonderful, health-affirming recipe! I bought some of the Gemini TigerNuts and received the today. I opened them up and popped one in my mouth and slowly tried chewing on it. It was hard as a rock. if I hadn’t been prudent I would have ended up with a cracked molar. I am now soaking them. Has anyone else found this issue? Thanks for the tigernut tip! The entire immune system requires healthy, balanced gut flora. Approximately 2 years ago I had a go-round with C diff, the result of high potency antibiotics. Some time after, I did the broth diet (did I get that 411 from NK, Jenny? Seems I did!) along with restoring probiotics. The unexpected upshot is that I was basically cured of IBS-D, with which I had absolutely *suffered* for probably 30 years. It made a believer of me, and I now take seriously the need to have good fiber in, and bad starches/sugars etc. out. Which means very little or no processed/convenience foods. And no foods containing pesticide and herbicide, as those chemicals will wreak havoc on gut flora balance. I finally bought some Tiger Nuts. They are very unusual. Takes a long time to chew up. The fiber is fierce – had to spit it out. My husband ate them. I couldn’t eat them because I had an allergic reaction. My lower lip and tongue swelled up. What service did you use to get your microbiome sequenced? I enjoy reading your blog, I’m a fan and also a nutrition student who loves cooking and learning about culturally significant nutrition. Very happy to see you feature tigernut, a food substance i grew up eating a lot in Ghana. Knew it was nutritionally dense as nursing women are traditionally told to eat them to increase their milk. We typically chew on them as snacks or make a milk sometimes fermented out of it. Will call my mum to find out the recipes used. Thanks soo much for reminding of it, and sources it can be obtained. Theophilyn, I am not sure if you will see this but please share your traditional tigernut recipes! 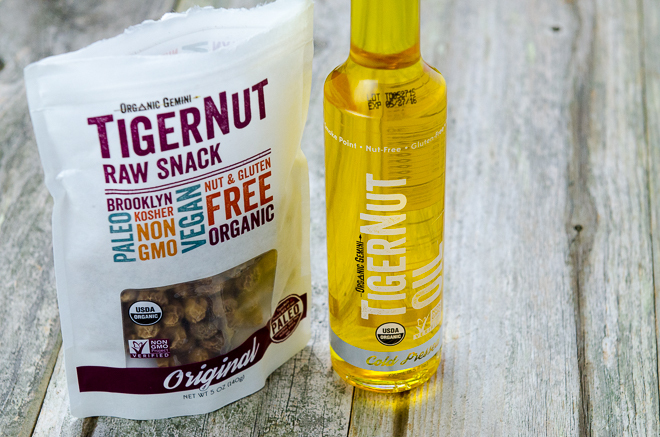 So cool to read about Tigernuts and their health benefits! I spent a summer in the Valencia region of Spain several years ago where their horchata is made of tiger nuts! They call it “horchata de chufa” and it was delicious- very different from rice based horchata. I’ve wanted to make some since I moved back to the US, at the time couldn’t find any way of buying the tiger nuts. Thanks for the source and the great info!